The Rhode Island Department of Environmental Management’s (RIDEM) Marine Fisheries Section has a long-time comprehensive fishery resource assessment program encompassing Narragansett Bay as well as Rhode Island and Block Island Sounds. The Marine Fisheries Section collects, summarizes, and analyzes trawl data for biological and fisheries management purposes. 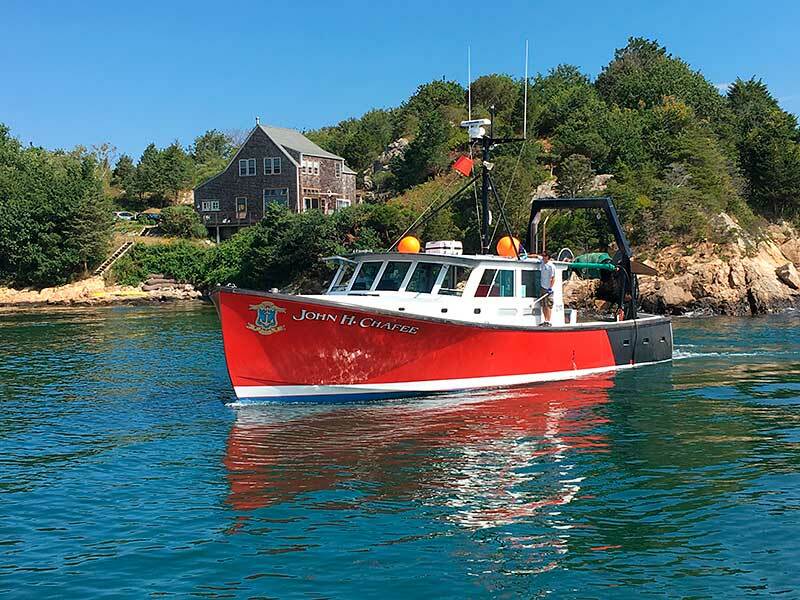 Both seasonally and monthly finfish and crustaceans inhabiting Rhode Island coastal waters are collected and identified in a trawl survey, which is conducted by towing a specially designed net behind a boat for a set distance. The fish in the net are then identified, counted, and measured. Trawl survey data are generally reported by catch in number or weight (biomass) per tow, known as catch per unit of effort (CPUE). An illustration of a typical trawl survey net. Photo courtesy of New Jersey Division of Fish and Wildlife. The trawl surveys provide insight into trends in abundance and distribution, population size/age composition, and the biology and ecology of species occurring in RI waters. 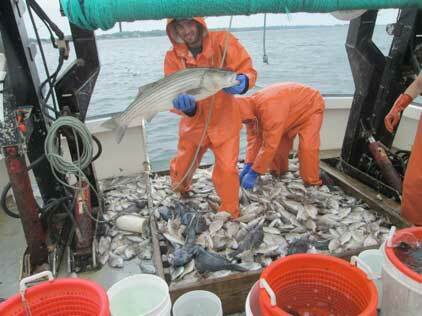 Researchers conducting the trawls record the aggregate weight by species (e.g., 57 total pounds of scup), frequency (e.g., seven winter flounder captured in two tows), individual length measurements, and various physical data like water temperature and depth. Stomach analysis and scale collection conducted in the field with subsequent laboratory analysis can provide accurate length-at-age estimates and insight into food chain dynamics and predator/prey relationships. All of these data help managers to develop plans that are based on ecological relationships. Since the inception of the Rhode Island seasonal trawl survey in April 1979, and the Narragansett Bay monthly trawl survey in January 1990, 6,385 tows have been conducted within Rhode Island waters with data collected on 132 species. Beginning in 2014, the RIDEM Marine Fisheries Section began recording more specific age and growth data as part of the survey. The 2018 survey season continues the collaboration of RIDEM with the University of Rhode Island Graduate School of Oceanography (URI GSO) Trawl Survey. One strategy for improving the health of coastal fish populations actually lies inland, in river restoration and dam removal. There are several species of diadromous fish that migrate between the ocean and freshwaters through rivers, so they depend on both habitats for their life cycle. Currently, a fish swimming upstream to spawning grounds will likely have to confront one of the 14,000 dams in New England, many of which block fish passage. Dams also alter the pattern of a river’s flow and transport of sediment, which can reduce fish spawning habitat in areas downstream from the dam as well. Work is being done to provide fish, such as herring, with assistance as they struggle to move up unpassable rivers, and efforts include netting and transporting small numbers of fish, improving fish ladders to provide fish-passable-routes, and removing dams that are no longer necessary. Fish ladders help fish return to their natural migration patterns, which have been blocked by human activity. Photo courtesy of Watershed Counts. In recent years, there has been an increased effort to remove older dams and restore fish runs to their previous condition by focusing on dams that no longer serve their intended purpose. Between 1990 and 2013, four dams (out of a total of 668) were removed in Rhode Island, with another significant dam removal completed in the spring of 2016: the White Rock Dam on the lower Pawcatuck River near Westerly. After severe flooding in 2010, the White Rock Dam was identified as a flood hazard. Dam removal was part of a larger project consisting of other dam removals and fish passage improvements, which aimed to restore 22 miles of mainstream, 48 miles of tributaries, and 1,967 acres of pond habitat for migratory fish populations in the Pawcatuck River, Mattatuxet River, Little Narragansett Bay, and surrounding estuaries in Rhode Island and Connecticut. The partnership that supported the project, included The Nature Conservancy, US Fish and Wildlife Service, Rhode Island Coastal Resources Management Council, and other federal, state, and local agencies. 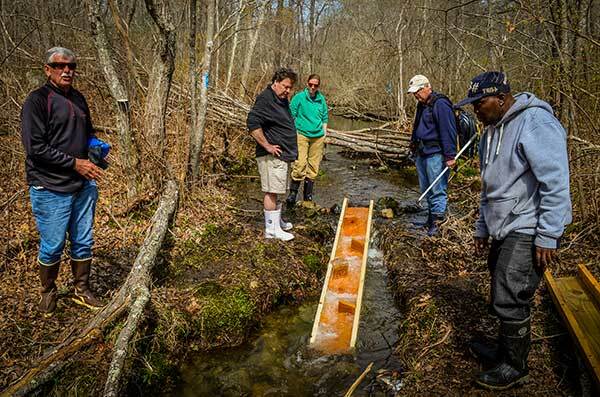 This significant cooperative hoped to improve spawning grounds for fish including shad, trout, alewife, and Blueback herring. A time-lapse video of the dam removal can be seen on The Nature Conservancy website. Continued monitoring will be instrumental in determining the response of coastal fisheries to these habitat improvement projects.